Tenerife, 1995. We stood watching as two lions paced in their tiny cage. One and a half paces forwards, turn, one and a half paces back, turn... in endless, shell-shocked silence. The classic indicator of captive wild animals in distress. The only furniture in their cage was a narrow sleeping shelf. We could see rusty nails protruding from the wood. The floor was littered with empty packets of dog food thrown between the railings. The corrugated iron roof absorbed the beating Spanish sun, making the temperature inside oven-like. Another day in the life for an animal rescue officer at the Born Free Foundation. Horrified tourists had alerted Born Free to the lions’ plight. We named them Raffi and Anthea and initiated a rescue mission. 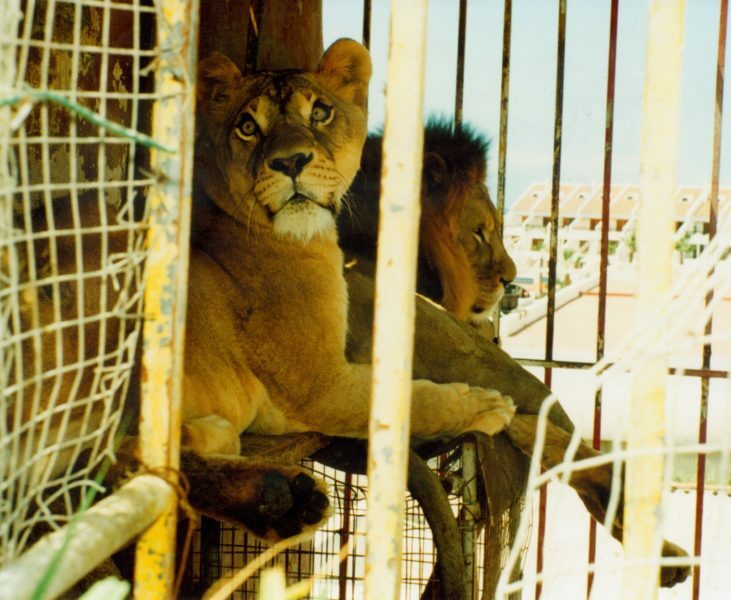 An exposé in a British newspaper helped raise public awareness and persuaded the authorities to confiscate the lions. Britannia Airways donated the flights to a sanctuary in England. Here Raffi and Anthea could run and walk on grass, perhaps for the first time in their lives. Seeing their excitement as they experienced this new world was a magical moment I’ll never forget. Two years later they were offered a permanent home at the Shamwari Reserve in South Africa -- a beautiful, expansive, safe bush enclosure where they could experience the sights, sounds and smells of their ancestral homeland. Raffi and Anthea were the lucky ones. Concerned tourists have continued to alert us to the plight of captive animals all over the world and we have rescued more than 70 animals, from dolphins in a crumbling pool in Turkey, to leopards in a run-down zoo in Cyprus. But it’s simply not possible to rescue every animal in need. There aren’t enough sanctuaries or resources for the sheer number of animals that have been caught up in the tourism industry. Some rescued individuals can be released into the wild but in many cases the animals have been too damaged by their captive experiences to survive. The fortunate few animals that are rescued have their lives transformed. Some of our high profile rescues have helped us close circuses and failing zoos and dolphinaria forever. The success stories also help raise awareness of the many ways that captive animals are exploited for entertainment by the some aspects of the seedier side of the tourism industry. However, faced with the scale of the problem, rescues will never be the solution. We have to ensure that the industry changes its ways, and compassionate tourists can lead the way by not visiting attractions that use wild animals in this way. If we vote with our feet, the money will dry up, and the businesses will become non-viable. It is our dream that one day wild animals will be found only where they belong -- in the wild.